Rotary Table, Milling, Drilling, Face Heading, O-Ring Grooving, Lapping Plate Grooving, Slurry Grooving, Slotting, And Much More! Turning, Milling, Drilling, Tapping, Angular/Radial Notching, And Much More! Interpolations, Milling, Drilling, Slotting, Tapping, Notching, And Much More! Turning and Angular, Facing, Boring, Drilling, Grooving, And Much More! Mining • Machine Tool • Wind Energy • Pressure Vessel • Medical • Paper • Environmental • And Many More! 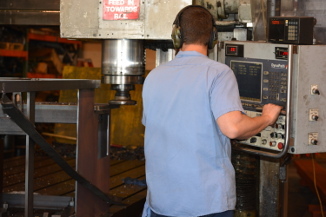 D Machine, Inc. prides ourselves on the versatility of our machining capabilities. D Machine, Inc. has been trusted with an extensive variety of large and medium sized parts since 1967. D Machine, Inc. excels at new challenges and works hard at making it work for you! Contact us to discuss your next turning or milling application. We look forward to speaking with you! Website by: Ablesoft Solutions Inc.